A Good Disruption highlights some of the huge costs that are at stake, and argues that managing such disruption will be the defining business challenge of the next decade. In order for us to meet that challenge, the book sets out a bold and inspirational vision for a more robust and sustainable economic model. 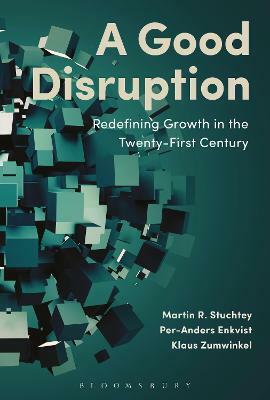 Rich in relevant case studies, and incorporating industry examples from around the world, A Good Disruption accomplishes the remarkable feat of synthesizing key contemporary trends into a coherent world view of how to seize the potential of our collective futures. This is essential reading for policy makers, politicians, business executives and social scientists, as well as anyone who wants a deeper understanding of the impact of disruptive technology and how it can be transformed into a major force for the global good. Martin R. Stuchtey is founder and managing partner of SystemiQ Ltd, a specialist for large-scale environmental programs. Previously, he worked at McKinsey in various leadership positions, most recently as Director of the Center for Business & Environment. He is a strategic advisor to the World Economic Forum and a professor for resource strategies. Per-Anders Enkvist was a consultant with McKinsey for 15 years, for the last seven of which he was a partner in its sustainability practice. He was the global leader of McKinsey's work on climate change and a co-leader of its work on the circular economy. Per-Anders recently founded his own consultancy, Material Economics. After 10 years as a senior partner at McKinsey, Klaus Zumwinkel became CEO of Germany's largest mail order group, and subsequently of the German postal service, now Deutsche Post DHL. He has also served on numerous boards, including Lufthansa, Morgan Stanley and Deutsche Telekom.